Mattanawcook Academy's Alex Brown goes up for a shot over Penobscot Valley High School's Reece Carter in this Feb. 20, 2018, file photo. 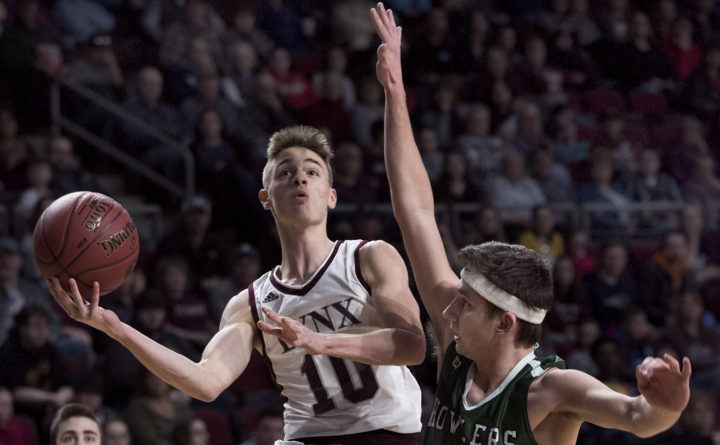 DEXTER, Maine — Alex Brown is familiar with the great names of Mattanawcook Academy basketball past and has committed himself to creating a new legacy at the Lincoln school based on present-day hardwood standouts. That effort won’t be at full capacity until tournament time next month, but what began with a humbling start four years ago is now taking shape, according to the senior point guard’s best-case scenario with the Lynx the lone undefeated team left in Class C North after Thursday night’s 41-34 victory at previously unbeaten Dexter. MA’s return to basketball prominence, which began last winter with a 12-6 regular season and a trip to the Class C North semifinals, followed a considerable down time for the program. The Lynx went a combined 11-79 from 2013 through 2017, including 3-33 during the first two high school seasons for current seniors Brown, Max Woodman, Kris Milner, Nate Ring and Cayden Spencer-Thompson. The return to Class C after two years in Class B coincided with the continued development and increased maturity of the Lynx, which first showed itself during the 2017-18 season opener against neighboring rival Penobscot Valley of Howland. MA went on to have its best season since 2012 last winter and reached the regional semifinals before being ousted by Fort Fairfield, a loss that motivated the five most veteran Lynx for their final chance at postseason glory together this winter. Defense has fueled the team’s success under third-year head coach Lucas Turner, with the Lynx allowing just 39 points per game through six games. That’s been complemented by an often balanced offense quarterbacked by Brown, a fourth-year varsity player. Those roles were evident against Murray’s Tigers. Brown created opportunities for himself and his teammates, with Woodman another key offensive contributor. Spencer-Thompson, the Louisville-bound long jumper and triple jumper, came up big late in the game with a go-ahead slam dunk followed immediately by another basket after he grabbed an offensive rebound. Ring played a key defensive role in the contest and along with Milner helped the Lynx outrebound Dexter 37-24. “In the first six games coaches have looked at MA and who they’ve got to stop, and it’s Alex Brown,” Turner said. “But being a senior-laden team, whether it’s Nate or Max or Cayden or Alex or Kris, we go wherever the matchup we want is,” Turner said. How long the Lynx will remain unbeaten is uncertain in a deep Class C North field. The team plays next on Tuesday at three-time defending Class C state champion George Stevens Academy of Blue Hill, and MA has two games left with the Eagles and top-ranked Houlton as well as return matchups against Dexter and Penobscot Valley. Those four foes entered Friday’s play with a combined 25-5 record.